You may have recently passed your test but it takes years to hone your driving skills. Along the way, you’re likely to pick up lots of habits. Some of these will be innocuous - like always setting the radio volume to the same level - others could be downright detrimental to the health of your car. One of the biggest mistakes new drivers make is with their clutch pedal. Pressing it too quickly could stall the car, while prolonged usage could put unnecessary strain and wear on the clutch, resulting in the need for premature clutch repair. It’s all about gaining a balance through practice. You should have learned a degree of clutch control in order to pass your driving test, however, as you head out on the road alone, you might lose some discipline and slip into bad practice. Bear with us as we remind you of correct clutch procedure and why it’ll help you to avoid a clutch replacement cost. Pressing the car clutch temporarily separates the flywheel and clutch plate, disengaging the engine from the transmission and drive shaft, and allowing gear change. During this time, the car is effectively coasting with no power being applied directly to the wheels. As the plates come back together, the transmission reconnects with the engine and the gears engage, power is once again restored to the wheels, allowing speed to increase or decrease as required. 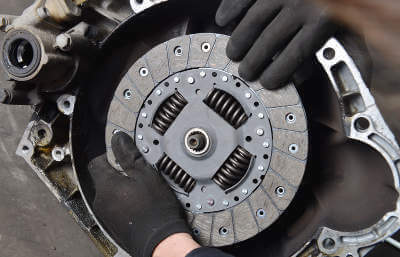 Understandably, many new drivers are wary of forgetting to use the clutch when they change gear. As a result, they drive with their left foot permanently resting heavily on the clutch pedal, heavy enough to keep the clutch plate and flywheel just out of full contact. This ‘riding the clutch’ results in the plate and flywheel slipping against each other, causing friction that wears them away. Eventually, they will be unable to engage fully, the clutch fails and you’re left looking for a price for a clutch replacement. It’s also tempting to ‘ride the clutch’ when running downhill as the momentum will ensure that the wheels keep turning despite the engine not engaging with the drive shaft. However, as well as the resultant wearing of the clutch plate and flywheel, this means that you’ll have less control over the car as gears play a big part in controlling speed. And there’s no avoiding the cost of a clutch repair as failure to replace the clutch at the first signs of damage could result in the destruction of other engine parts. So spare yourself the expense by keeping your foot well away from the clutch pedal until you need to change gears. Waiting at traffic lights in first gear with brake and clutch engaged puts a strain on both devices. Far better to place the car in neutral and apply the handbrake. As well as minimising the wear on the clutch, this is also the safer option if your foot should slip off the clutch, for example, if bumped from the rear. You won’t lose anything by taking a few extra seconds to put your car into gear and release the handbrake when the lights change. Parking in gear also places a strain on the clutch plate and, unless you are parking on a slope, it’s not at all necessary. Let's keep things simple, get familiar with the biting point which is essentially the sweet spot in the clutch, to find the biting point, press the clutch down and move the gear to fist then slowly lift your foot off the clutch and press the accelerator lightly to get the revs up. Doing this will prevent the driver from stalling, you would need to apply more revs if you were going up a hill. You will feel the biting point in the clutch because it will the engine sound will change. When you push the clutch in this slows the car down and pulling the clutch out (not the full way) will speed the car up, this is also known as ‘clutch control’. When changing gears, try to do it swiftly and decisively but gently to minimise the length of time that the clutch pedal is pressed and experiencing friction. Look ahead in the traffic so that you can predict the actions of other cars and be ready to change gears appropriately. But don’t panic, before long, as you become a more experienced driver, you’ll do this automatically, making your driving experience smoother and your clutch last longer. When all’s said and done, even the most experienced drivers experience car clutch problems. If you think that your car might be in need of clutch repair, get an independent quote from a network of vetted service providers at MyCarNeedsA.com. In the meantime, take time to consider your driving habits so that you can enjoy years of happy motoring without the repair bills.